Recruiting for Good is on a fun mission to help fund camp scholarships; and is rewarding participation with party travel to experience the Olympics in Sweden. SANTA MONICA, CA, UNITED STATES, April 1, 2019 /EINPresswire.com/ -- Recruiting for Good a staffing agency on a mission to help fund summer camp scholarships is rewarding participation with fun party travel. 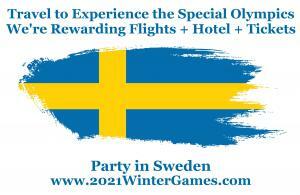 Join to help kids and enjoy fun trips; we're rewarding travel to experience the 2021 Winter Special Olympics. According to Recruiting for Good, Founder Carlos Cymerman, “We just launched 'We Party for Good' to reward people who participate in our staffing agency; with flights, hotel, and tickets to the World's Best Parties. Our exclusive purpose driven service is perfect for families and friends traveling to support athletes (who are family members) competing at the Special Olympics, and fans who love following Team USA." Make a referral to Recruiting for Good before December 1, 2019 to participate and earn travel saving rewards. 1. Refer a family member or friend for a fulltime position in engineering or tech (upon completion of 90 days employment, we reward $1500 toward flights, hotel, or tickets to the games). 2. Introduce an executive or senior manager (you personally know, that is hiring professional staff); once we find the company a new hire, and the newly hired employee completes 90 days of employment (we reward $2500 toward flights, hotel, or tickets to the games). 3. A portion of each placement made will be donated to help fund summer camp scholarships. Carlos Cymerman adds, “We love to help families and friends enjoy the Special Olympics, See the World...and Party for Good."